Overview: Marvel revisits the X-Men after a nearly three-year span between Essential volumes. What a rough time it is to be a member of the X-Men! The story starts out with the first Brood war, and introduces us to the second costumed identity for Carol Danvers, as Binary. A new member of sorts joins the team as Lockheed the Dragon is paired with Kitty Pryde. Following this battle with the Brood, which nearly claimed the life of Charles Xavier, we see the X-Men return to Earth to literally find New Mutants living in Xavier’s Mansion, forever changing the dynamic in the X-books. A new group of mutants, the Morlocks, are found living in the tunnels of New York City. To save her teammates, Storm must fight for control of the Morlocks with Callisto. At this same time, the X-Men face a moral challenge as a reformed Rogue comes to Xavier asking for help in controlling her mutant power. Not only is she welcomed into the mansion, she is placed on the team despite the objections from many of the active X-Men. A new romantic interest is presented to Cyclops in the form of Madelyne Pryor, who bears a sinister resemblance to Scott’s former love and fellow X-Man Jean Grey. In a whirlwind romance being manipulated by Mastermind, it culminates in the wedding of Scott and Madelyne and the retirement of Cyclops from the team. For anyone reading the second edition of this Essential, Annual #7 is a fun romp as the Impossible Man sends the X-Men on a scavenger hunt. Every now and then, the writers throw in an issue like this, where things are not grim and gritty for the mutant team. You get to see them unwind, whether playing baseball on the lawn of the mansion or watching a movie together. There is a lot of humor in this particular issue, and this is one of the first times we’ve seen the Impossible Man used in a book other than the Fantastic Four. What makes this Essential? : This is a must-have volume in anyone’s collection. Between the Brood war, the introduction of the Morlocks, an apparent wedding for Wolverine (left at the altar) and a wedding for Cyclops (preceded by a drag-out fight with Mastermind). In particular, the famous “God Loves, Man Kills” story is one of the most-important X-Men stories of the 1980s. For years, writers have used the X-Men and the subject of mutants as a soft allegory for race and ethnic relations in America. Beginning here, Claremont and others make this an ongoing discussion point in the books. John Romita, Jr., starts a three-year run on the title in this volume, taking over from Paul Smith’s beautiful run. These are some of my personal favorite stories, as I started collecting the title off the rack in this era. Uncanny X-Men #171, with Rogue joining the team, was my first purchase in this corner of the Marvel Universe, and I was hooked for life. Footnotes: In an ongoing move to include additional material, Marvel adjusts the content listings between the first edition and the second edition of this Essential volume. The first edition contains annual #6, while the second edition contains annual #7, along with Marvel Graphic Novel #5. The inclusion of Marvel Graphic Novel #5 causes some issues with the look of the reprint. The Marvel Graphic Novel line was a deluxe book printed on a heavier paper stock. The dimensions of these books were just a smudge smaller than an 8 1/2″ by 11″ sheet of paper. In comparison, a standard modern-size comic comes in at approximately 6 1/2″ by 10″. As a result, it was necessary to reduce the size of the Marvel Graphic Novel reprint in order to fit the Essential format. While it is still readable, having a pair of magnifying glasses handy might be helpful when re-reading this story. If you like this volume, try: the Leave It To Chance series by James Robinson and Paul Smith. This incredible series from Image Comics in the late 1990s told the story of a teenage girl, Chance Falconer, and her pet dragon, St. George – a nod of the hat to Kitty Pryde and Lockheed, perhaps. Chance is the daughter of Lucas Falconer, a paranormal investigator in the city of Devil’s Echo, a world where magic is common. Chance finds herself getting into trouble as she tries to assist her father in solving cases. This all-too-short series started very strong, but was plagued with publishing delays towards the end. Smith’s art follows the 1990s animated style, with smooth, clean drawings that look to have been taken from a TV screen. Nearly the entire series has been reprinted in a series of hard cover collections from Image. This is a great all-ages storyline that should be in all collections. This entry was posted in Marvel Essentials, X-Men and tagged Chris Claremont, Dave Cockrum, John Romita Jr., Paul Smith, X-Men. Bookmark the permalink. Pingback: Throwback Thursday – Essential X-Factor Vol. 1 – WORST. COMIC. PODCAST. EVER! 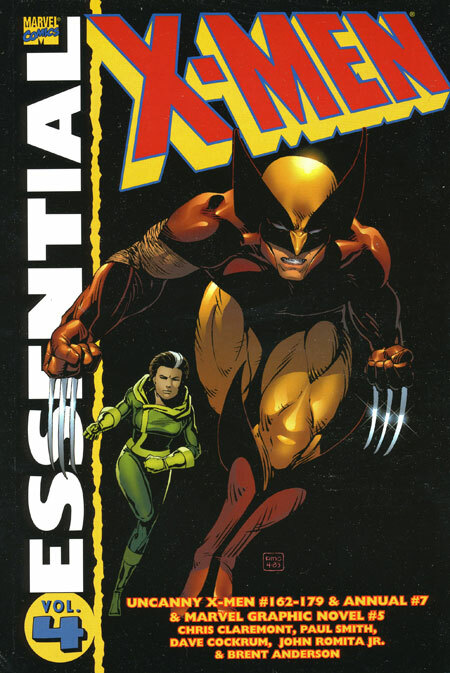 Pingback: Throwback Thursday – Essential X-Men Vol. 4 – WORST. COMIC. PODCAST. EVER!